To the Most Reverend Hierarchs, Priests and Deacons, the Monks and Nuns, the Presidents and Members of Parish Councils, the Day, Afternoon, and Church Schools, the Members of Philanthropic Organizations, the Youth and Youth Workers, and the entire Antiochian Orthodox Christian Family of North America. On the evening of March 19, 2014 we received the sad news of the passing of His Eminence Metropolitan Philip, our dear and beloved brother and concelebrant in Christ. The repose of His Eminence, being sudden and unexpected, caused a profound pain in my heart and the entire Orthodox Christian family in the United States of America. For more than 15 years I have had the opportunity and privilege to work closely with Metropolitan Philip. As the First Vice-Chairman of SCOBA and most recently as the First Vice-Chairman of the Assembly of Canonical Orthodox Bishops of North and Central America, he passionately supported a common witness to our Orthodox faith in the world. It is well known that he spoke his mind openly on a number of important issues and would often challenge inactivity surrounding serious issues, which he felt Orthodoxy could address in unique and important ways. But in essence, the very characteristic of Metropolitan Philip was his identity as a shepherd, a father who cared for and labored diligently for his flock. Before setting of the sun each day, Metropolitan Philip reflected upon the future well-being of his beloved spiritual sons and daughters. Each of you has felt his paternal love in a most personal manner. It was Metropolitan Philip who ordained and enthroned so many of the bishops of the Antiochian Orthodox Archdiocese of North America; he helped educate and ordain countless parish priests; he joined so many of you in holy matrimony and celebrated with you as he baptized your children and grandchildren; he even wept and mourned with you with the passing of your loved ones. 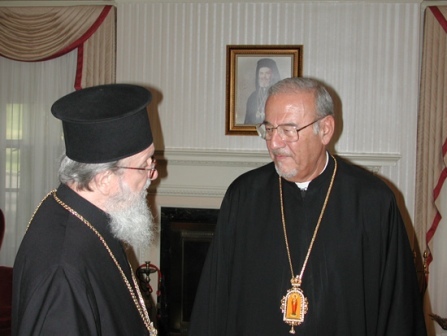 In voice and in one mind, the hierarchs of the Assembly of Canonical Orthodox Bishops of North and Central America offer thanksgiving to God for the 48 years of dedicated service of our beloved brother as the head of the Antiochian Orthodox Archdiocese of North America, and I extend to each of you my heartfelt and sincere condolences for the loss of your father. Let not your hearts be troubled nor let them be afraid, for the Holy Spirit, the Comforter, will surely grant everlasting repose to Metropolitan Philip’s soul and will soon deliver unto you a shepherd who will bear the mantle of faith on his shoulders for the coming generation.